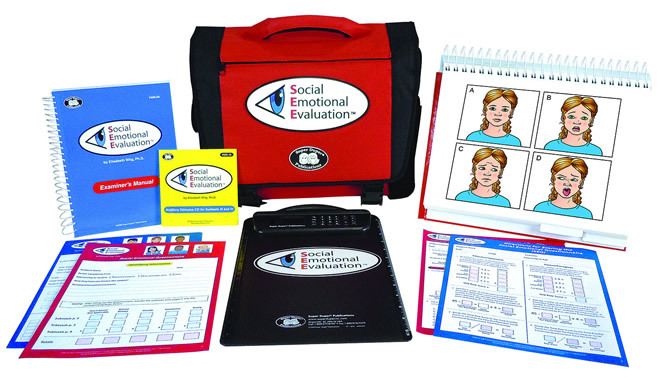 The Social Emotional Evaluation (SEE) evaluates the social skills and higher level language that students need to interact successfully in everyday situations at home, school, and in the community. The SEE presents typical social situations and common emotional reactions that elementary and middle school students encounter frequently. It is ideal for identifying social and emotional language needs of students with autism spectrum disorders, emotional disorders, learning disabilities, or attention deficit disorders. To ensure that you administer auditory stimuli consistently, an audio CD accompanies Sections III (Understanding Social Gaffes) and IV (Understanding Conflicting Messages) of SEE. Use the Teacher/Parent Questionnaire as a quick screening tool to help determine whether you need to administer the full evaluation or confirm test results. The SEE includes five subtests for assessing social language. Understanding Social Gaffes-The student looks at a picture of a social situation and listens to an accompanying audio clip, then he/she identifies whether everyone in the situation behaved appropriately. The standardization samples for the SEE included over 800 children for the standardization sample and closely resembles U.S. Census Bureau Data for 2007. Test-retest and inter-rater reliability were all very high and over .88. “All test users, regardless of level and profession, are expected to abide by the standards set forth by the APA, AERA and NCME regarding the ethical use, protection and dissemination of all test materials. All orders for the products listed below cannot be completed online, they must be placed on official institutional purchase order forms or professional letterhead. For questions or help placing your order for these items call (800) 880-4433.